The DICKOW®-Inline-Pumps, series NCV / NCVL, have been developed for the chemical, petrochemical and related industries. Since the pumps are installed inline, only a minimum of space is required and therefore, these pumps are suitable for package units. No time-consuming alignment of couplings is required. Ball bearing failures through inadequate alignment are excluded. 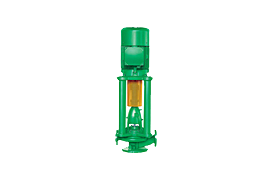 With a wide selection of materials and shaft sealing systems, the NCV-pumps are suitable for handling nearly all kinds of liquids used in the above mentioned industries. For example: acids, lyes, hydrocarbons, hot water up to 234 ºC (455 ºF), hot oil up to 350 ºC (660 ºF), cooling fluids, solvents etc.